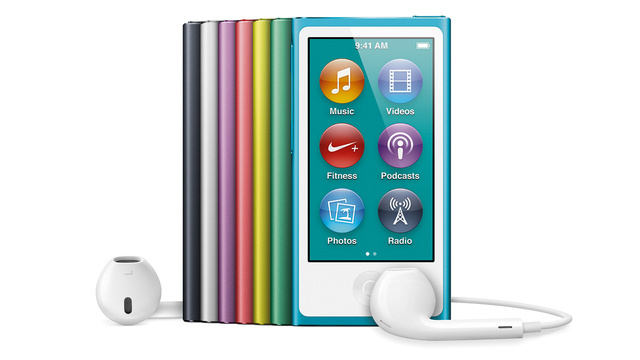 Joining the release of the iPhone 5, Apple has unveiled a completely redesigned iPod Nano (sorta). The new iPod touch keeps the touch screen from the previous generation but increases the size and allows playback of 16:9 movies. Once again, the iPod Nano regains the ability to playback video, which was taken out due to the tiny 1:1 touch screen of the 6th gen. It also comes in a variety of colours ranging from black, grey, purple, pink, green, a darker green, and blue. The new iPods will also feature Bluetooth for the first time as well as Apples brand new lightning connector and the longest battery life the device has ever had. The new Nano should go for $150 U.S for the 16 GB and will be available in October.